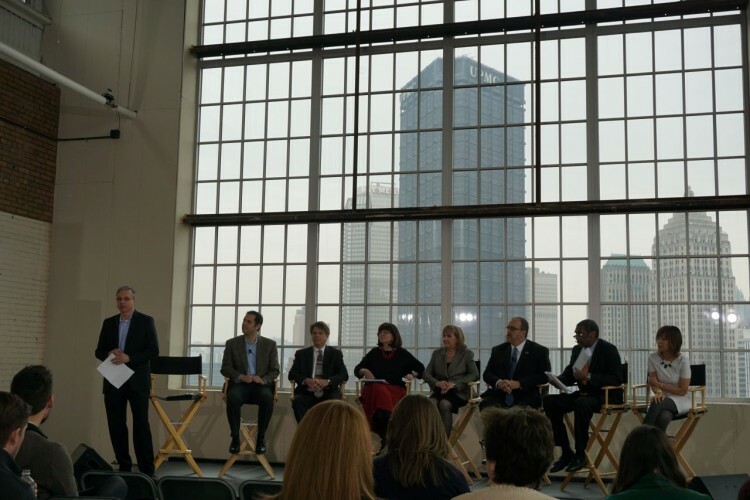 As one of the hosts, President of the Heinz Endowments Grant Oliphant, said during the event, “There’s no better place” for the conference with its mission to elevate Pittsburgh than the revitalized building dubbed the Energy Innovation Center. Formerly the Connelley Trade School, the 208,000-square-foot building is the result of a public/private partnership years in the making that will soon hold hundreds of students in 28 apprentice programs, along with five Pittsburgh universities, numerous nonprofits and businesses, a co-working space, design lab and plenty more to come. The basement alone will sport a 9,500-square-foot Community Kitchen facility to engineer new ways to make high volumes of food using fewer chemicals, electricity, paper and gas. “The Energy Innovation Center is a good example of a public private partnership and the kind of reinventing that Pittsburgh is known for,” says Bill Generett of Urban Innovation21, a public/private venture that supports entrepreneurship that is scheduled to move into the building next week. 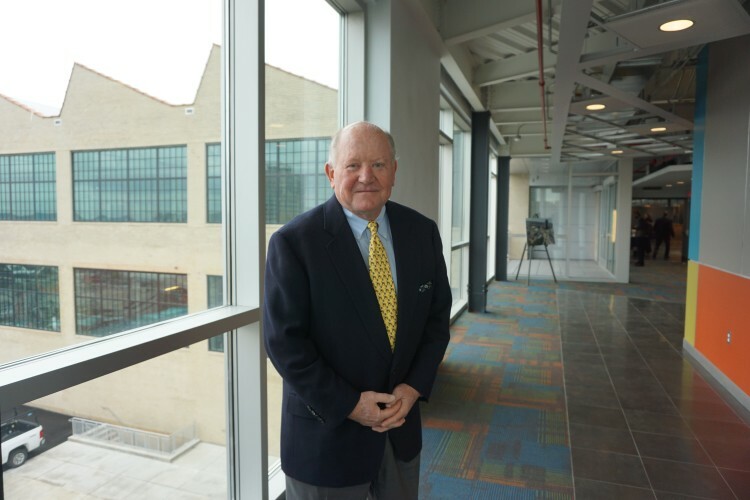 In the beginning, as the vacant Connelley School sat long idle on its perch in the Hill District, Congressman Mike Doyle and PA Senator Jim Ferlo convened folks around green jobs and development, which morphed into a group calling Green Innovators. What if we had a place to do this kind of work? they asked. When the Pittsburgh Public Schools put the Connelley school up for sale, the Green Innovators group jumped, asking Pittsburgh Gateways Corporation to take it on. “There was literally no money, then as we added more participants, everyone had more expectations,” says Bob Meeder, CEO of Pittsburgh Gateways Corporation. The project eventually got support across the city from foundations and banks as well as political figures although it was on life support more than once, says Tom Bartnik, the first executive director for Green Innovators. But the stakes were high. Not only was this an opportunity for Pittsburgh to open a state-of-the-art technical career institute, but it was also a chance to jumpstart the economy of the historic Hill District, a neighborhood which has suffered mightily over the past half century from displacement, high unemployment, urban blight and now, an aging workforce. At the Shaping Davos event at the EIC earlier this year. 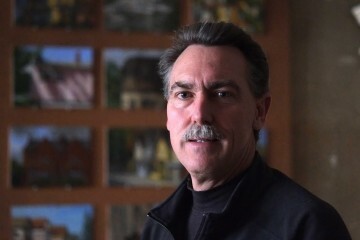 Photo by TC for NEXTpittsburgh. Investment in the community was a high priority for the EIC: the first phase of renovation to the Center was a $44 million project, 60% of which went to local, minority contractors. “And we’re advocating for these contractors for other construction projects. We want to go the extra mile by recruiting, training and forwarding local residents into the Center,” says Meeder, who expresses the desire for the EIC to be a community lab for residents who can look to it for career development as well. What kind of careers? The EIC will focus on those around green buildings. As technology improves, heating, powering and ventilating buildings will become more sophisticated and efficient. These “sweet spots,” as Meeder refers to them, will require skilled operating engineers, station engineers, independent contractors and suppliers to install, monitor, maintain and update them regularly. The success of the building and overall project will be based on how much synergy there is within and the objective is to make it part of the community, not an island in and of itself. Bill Recker, board chair of the Energy Innovation Center, in the building lobby of the first floor. Photo by Tracy Certo. Alongside the classes offered by Carnegie Mellon University, Robert Morris University, Duquesne University and the University of Pittsburgh will be courses from companies such as Eaton and nonprofit groups such as The Penn State Center. Students will exit the former Letche High School on the right side of the building to enter a corridor of opportunity, if you will, lined with the kind of groups and organizations they can learn from in their field. While the EIC is not a known entity yet—most of the community leaders walking in for the start of the conference had never been there—it will be soon. Presenting to the high-profile p4 conference on the second day, Robert Meeder told the community leaders in attendance that “132 companies have infused their technology and process in state of art everything, including plug and play, from parking lot to gardens to shops to basement all designed for workforce development” and learning the STEM behind the application. The building houses a basketball court-sized corner room with floor to ceiling windows that offer dramatic views of the city overlooking downtown on one end and the Strip District on the other. The first event staged there was Shaping Davos, a morning-long session live-streamed to Davos, Switzerland showcasing local change makers on how Pittsburgh became one of the most innovative cities in the world. 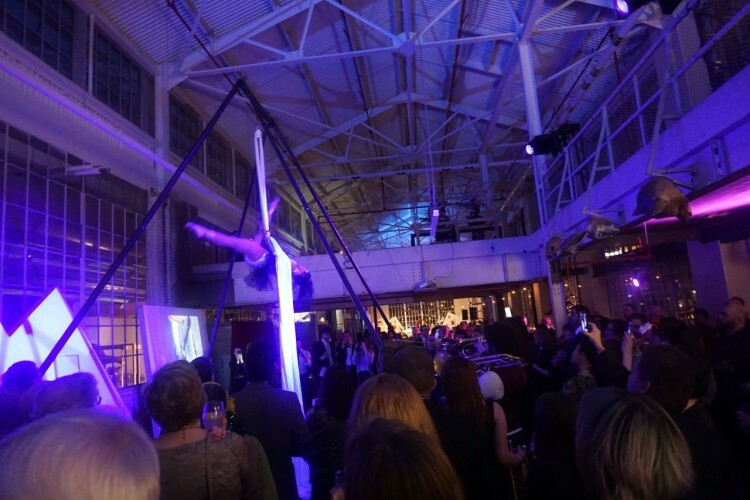 The second event was the Q Ball, the cutting-edge annual fundraiser from Quantum Theatre, which transformed the industrial chic room into a Parisian ballroom replete with silk aerialists and body-painted dancers and hundreds of attendees, many in colorful and creative costumes. And the third—the p4 conference—brought together those in the community who can make the kind of changes required of Pittsburgh in the future to make it not only sustainable, but a model of sustainability for the world. All three events represent the very energy—and synergy—the building founders had hoped for. “This project has been in the works for nearly 10 years, which is why it is so satisfying to see this building reused with respect,” says Marc Mondor, co-owner of evolveEA, the Center’s sustainability and LEED consultant. The team also consists of architect DLA+ Architecture; engineer CJL Engineering and contractor Mascaro Construction. “This is a historic building and much care was taken to leave historic elements intact,” he notes, adding that the project is about to receive a high-level LEED Platinum NC certification. 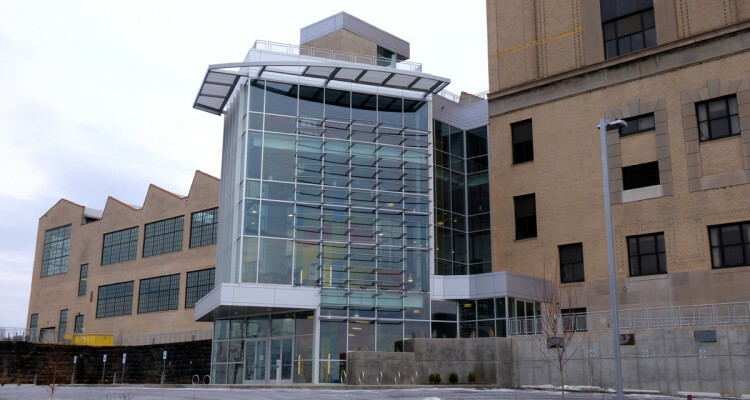 Of all the buildings in the Pittsburgh 2030 District, this one has a good chance of actually achieving the stringent 2030 energy conservation goals, explains Mondor. “This building really hits on all cylinders, with site, water, energy, materials, indoor air quality, tremendous daylighting and a desire to educate the community.” They even authored sustainability guidelines for tenants to follow. All of these processes are something the community as well as the students in the adjacent building—the Letche High School—will likely be schooled in. 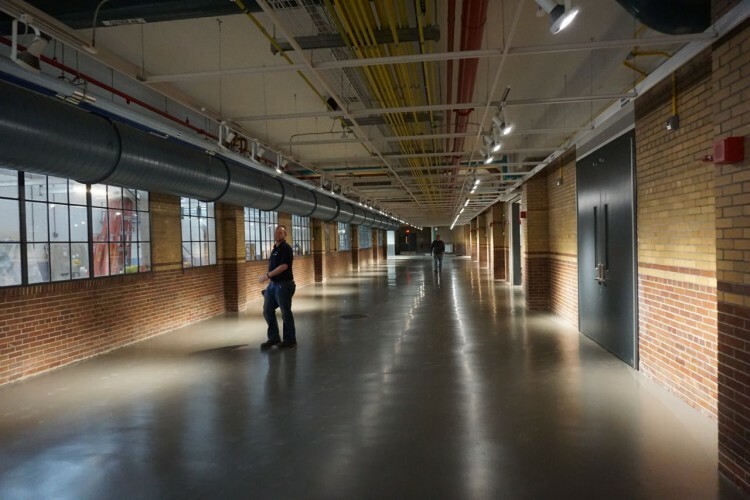 The polished interior of the newly renovated Energy Innovation Center. Photo by TC for NEXTpittsburgh. Community-focused learning is the key to EIC, along with student involvement, and “solution-oriented research” meant to improve the quality of communities, and enhance the success of local businesses and start-ups in technology, the nonprofit sector and art. Yes, art. 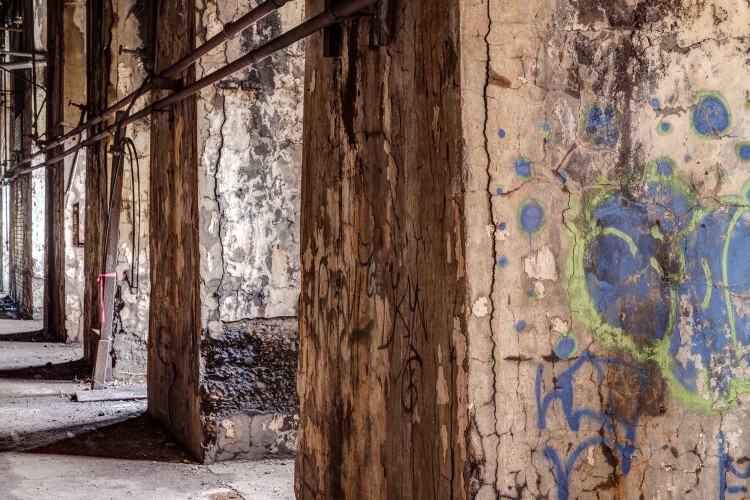 Across the hall from the large room now used for events, artist and entrepreneur Ryan Lammie recently established the second Pittsburgh location of Radiant Hall, an art space initiative based in Lawrenceville. The gallery showcases the work of up-and-coming Pittsburgh artists, such as Seth Clark, with the intent to become a work and learning space in the future. The diversity in career options, areas of activity and contributing partners could make the EIC a leader in the green technology field. An example, Bob Meeder hopes, that will be followed across the country. When the EIC fully opens its doors, the school hopes to graduate 2,000 students armed with the certificates necessary to operate the latest and greatest systems in the green marketplace. NEXTpittsburgh editor Tracy Certo contributed to this story.